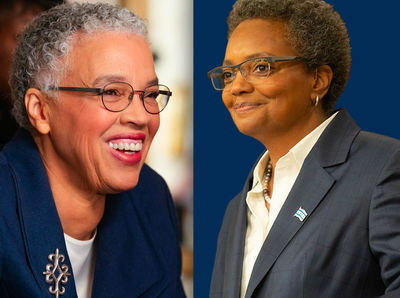 When the recent Chicago mayoral race began to heat up, never in my wildest dreams did I imagine that the primary election would culminate with two African-American women as the final contenders out of a field of about a dozen, destined for an April 2nd runoff. Either Toni Preckwinkle or Lori Lightfoot will become the first black female mayor in the history of my hometown. Chicago's first female mayor, Jane Byrne, was elected in 1979, and served until April of 1983. Chicago's first African-American mayor, Harold Washington, was elected in 1983 and died of a heart attack while in office in 1987. Both before and after their terms, Chicago was ruled by mayors named Richard Daley, one was the father, and the other was the son. In the last 64 years, there have been only two other elected (not counted the acting) mayors besides them: Mayor Michael Bilandic, who lost the office to Mayor Byrne after a fierce snowstorm when it seemed that he couldn't get the streets plowed fast enough. And the current Mayor Rahm Emanuel, who shocked everyone with his decision not to run for another term. Their election is coming exactly one hundred years after one of the most racially brutal chapters in Chicago history: the race riots of 1919. The riots occurred from July 27th through August 3rd, killing 38 people—23 black, 15 white—while injuring over 500. Though roughly 25 riots reportedly occurred during the period known as “Red Summer” that year was reportedly the worst on record. I was born and raised in Chicago and I still live here and care deeply about its future. When I first began traveling internationally back in the 1970's, I was surprised to learn that the gangster Al Capone was one of the first persons associated with Chicago's image. This was not good. So you can imagine how pleased I was when Michael Jordan and the Bulls were winning six championship rings, or when Oprah Winfrey was broadcasting from here, and even when my very own Roger Ebert and Gene Siskel were bringing news of movies from their balcony on "At The Movies." Carl Sandburg's city of of the big shoulders started gaining a rehabilitated image. But in the last few years I have heard more about the number of people, especially children, dying by gun violence. I am hoping that our next mayor will help to resuscitate our reputation of a world class city.